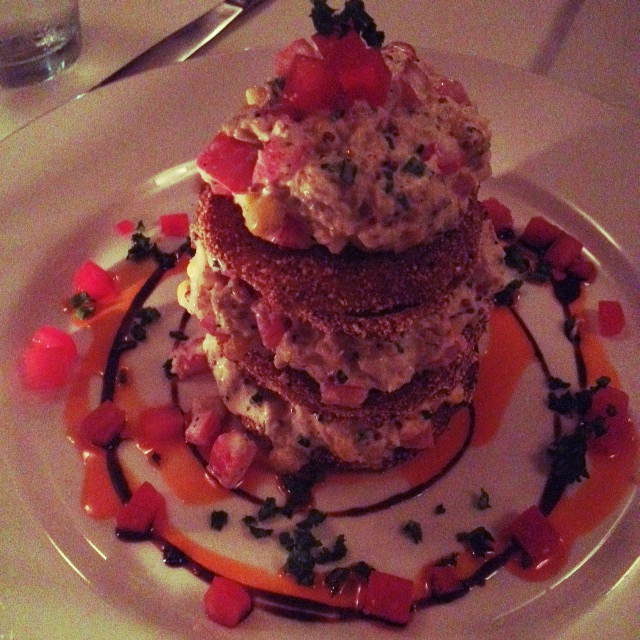 Fried green tomatoes stacked high and layered with sweet crab salad. Roasted half of beef marrow bone piled up with ruby red tar tar as described on the menu (tartare?). 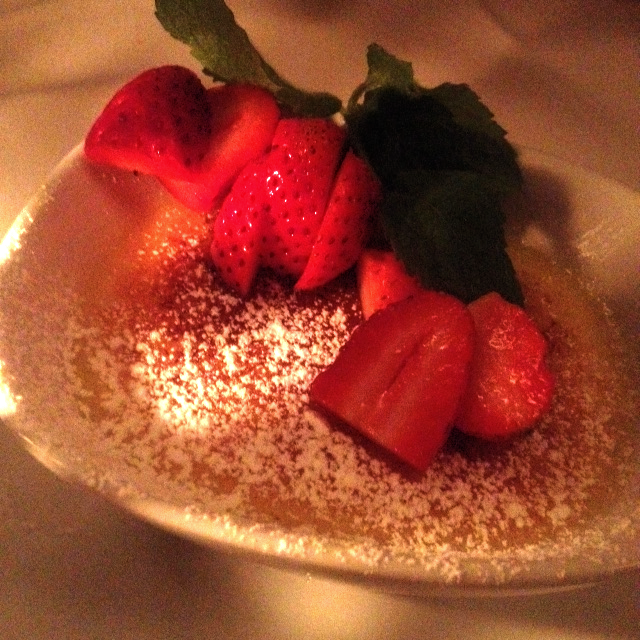 Velvety creme brulee complimented by tangy strawberries. Pecan pie in a jar with vanilla ice cream and mint sprig. 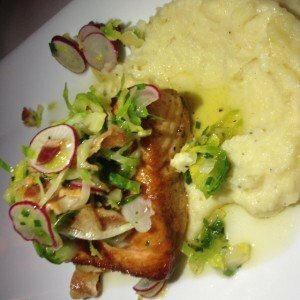 Salmon over parsnip puree and topped with bacon radish salad. K’s dinner menu makes you want to try it all. With 62,000,000 visitors annually, Orlando, Florida is the most visited tourist destination in the United States. 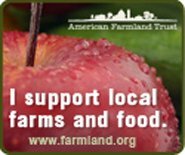 But while its theme parks beckon millions, our listings of farm to table dining options in Florida are not many in number. 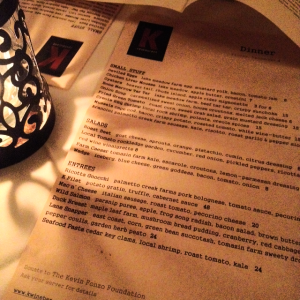 But there is one particular dining destination in the Orlando metro area that deserves kudos for its commitment to local food sources and the good food movement: K restaurant, located just north of downtown Orlando, in the heart of the College Park neighborhood. K restaurant (named for its chef/owner Kevin Fonzo, who trained at the renown Culinary Institute of America [C.I.A.] in Hyde Park in the Hudson Valley of upstate New York) is worthy of a special trip for the visitor as well as a destination for an Orlando area resident. A farm to table restaurant, located in a freestanding house with a wrap around porch and space on the grounds for a sizable vegetable and herb garden, this Florida restaurant is an inviting destination for diners who desire delicious food prepared with ingredients that are carefully sourced. The restaurant’s website includes information on the farms which provide ingredients used for the dishes on the restaurant’s menus, which change daily. On entering, a shelf of unwrapped soaps, which look like miniature Jackson Pollock paintings, attract close attention. 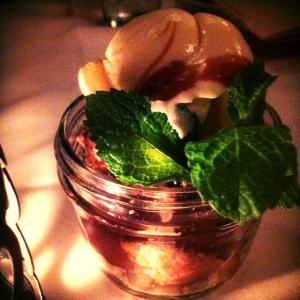 “Those are hand-made by one of our servers,” chimes the hostess who noticed our interest. If it weren’t for the bar and tables, the warm greeting, hospitable homey environment, and hand-made soaps made me think I was stepping into a creative friend’s home for a family dinner. The Chefs Move to School program assists chefs in adopting a school and working with teachers, parents, school nutrition professionals and administration to help educate children about food and to show them that healthy eating can be fun. One school year, chef Fonzo worked in the Orlando school’s cafeteria every day, preparing fresh, healthy lunches utilizing ingredients from the school’s garden. He continues to share his knowledge and skills at the school, and now every Thursday volunteers for a full teaching schedule for the day. He uses cooking instruction as an integrated education method, where the students learn about nutrition, biology, chemistry, practice math skills and the cleanliness and discipline necessary for a culinary career. Freshly chopped garlic and herbs tease the nose as we’re led through the gently lit dining room to our table. Our server continues the familial treatment, suggesting his favorite dishes and informing us that the seasonings we smell are from the bountiful backyard garden. His favorite phrase to describe the food is “on point,” and he’ll get no debate. The dishes served at K restaurant will perfectly satisfy our search for excellent, “spot on” farm to table dining in the Orlando, Florida area. My dining companion and I start with three appetizers. A delicious seafood appetizer of green tomatoes fried in a cornmeal crust and layered with sweet crab salad is lightly sweet, with a touch of savory grain mustard. The crab is divine and uncompromisingly fresh. Our server notes that K restaurant doesn’t have a walk-in cooler or large freezer system like most restaurants and most ingredients arrive at the beginning of the day. Arancini (fried rice balls) stuffed with Palmetto Creek (a family owned and operated farm, which “started as a family 4H project that totally changed our lives for the better”) pork sausage follows. These delicious treats burst with flavor. Kale and roast garlic accentuate the risotto in perfect proportion. 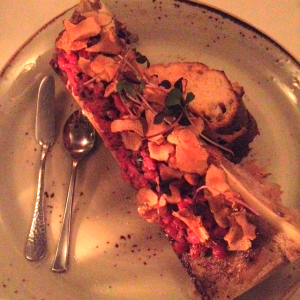 A third appetizer of bone marrow tartare, made with beef from Lake Meadow Farm, is a truly inspiring dish consisting of a colossal beef bone sliced in half and roasted. The buttery marrow is topped with gorgeous ruby tartare, diced tomatoes and herbs. We slather the accompanying crostini with the beef bounty and finish off every morsel. These appetizers could have easily been enough for two as dinner, given the generous size of the servings. We refresh our palate by sharing the kale caesar. Sourced from the backyard garden, the salad is dressed lightly in a sumptuous, classic Caesar dressing. It’s the perfect respite between our rich first courses and the main events, wild Pacific Northwest salmon and duck breast. The salmon prepared medium-rare upon recommendation by our server, rests atop buttery parsnip purée. A bacon salad, featuring Frog Song Organics’ radish, garnishes the fish. An impeccable dish! I debated between it and the snapper, the local day boat catch. Though inclined to try the east coast Florida fish, our server’s enthusiasm and the promise of bacon salad tempted me otherwise. I will have to try the snapper on my next visit. The duck breast from Maple Leaf Farm (based in Indiana) accompanied by a mushroom bread pudding, red cabbage, and cranberry, was cooked to perfection and its cranberry tartness especially pleased my dining companion. For dessert, the pecan pie and creme brulée were delicious sweet endings to the meal. After dinner, we take a stroll to the garden out back (a wonderful setting for the restaurant’s wine tastings, pig roasts, oyster roasts, and even weddings). Serendipitously, chef/owner Kevin Fonzo, watering the garden, graciously offers us a quick tour, pointing out lemon verbena and rosemary, the sweet potatoes he has just dug up this week, recently harvested grape vines, bushy kale plants, and plump pumpkins. Offering us a glass of white wine, we sit at a patio table and this remarkable man shares the history of K, from its conception 15 years ago to its expansion and its eventual move to its current location. His volunteer work at the local school will soon expand to include beehives, a second garden plot, compost pile, and a worm farm; how awesome, like our meal! With its impressive food and the congenial, laid-back atmosphere, K restaurant is a destination restaurant worthy of return visits.